The original inhabitants of two must-visit East Bay parks were a Gold Rush romantic poet and a revolutionary Ukrainian priest. 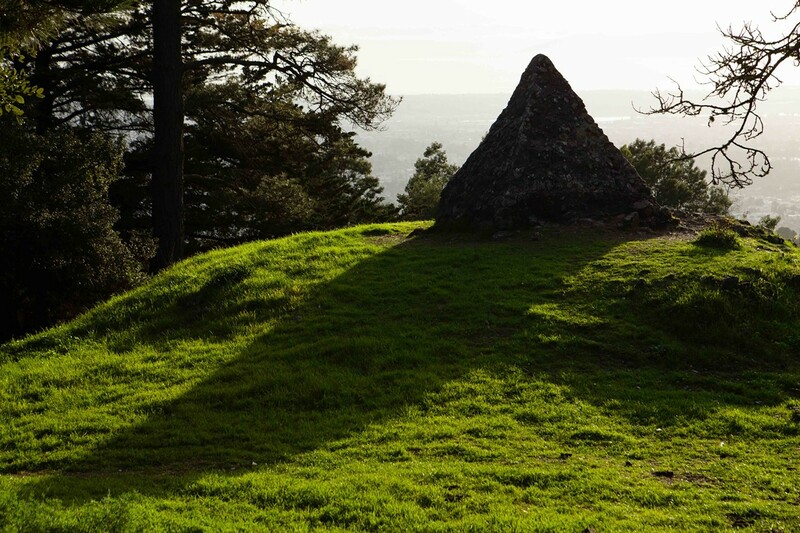 Joaquin Miller erected this stone pyramid in honor of the prophet Moses. Joaquin Miller once described the Bay Area as a "careless, languid Arcady," freighted with the perfume of yucca blossoms, softened by warm sea winds drowsing over dreamy hilltops. That seems a far cry from today's Bay Area: 8 million restless souls roaring across superhighways of cars and superhighways of information through the epicenter of the future. In Miller's time, the late 19th and early 20th century, there was a thirst for lyrical tales of a wild American West, and Miller gave Eastern audiences, and locals, a vision of California untamed, a majestic vista so rugged that it earned him the nickname "Poet of the Sierras." Miller was larger than life. He joined the filibusterer William Walker's mercenary assault on Nicaragua in 1844. He variously fought against, and alongside Native Americans, protecting their land from white settlers. He was briefly an Oregon judge. He was a horse thief, and some said a compulsive liar. But it was Miller's bardic Occidental poetry that won him lasting notoriety. A wanderer in many lands was I/a weary Ishmaelite, Miller wrote in "An Indian Summer." [I] had seen the Crescent-mosques/had seen, The Druid oaks of Aberdeen. In old age, Miller made his home in the Oakland hills, at a place he called "The Hights." It was a dusty treeless escarpment. There, Miller re-planted the timber that had been cut to build San Francisco, and his saplings grew into the majestic redwoods and oaks that today shade Joaquin Miller Park. At roughly five hundred acres, with trails that wind through canyons and loop atop ridges, Joaquin Miller Park is big enough to spend an entire day hiking in. Miller's peculiar art, like a hybrid cross of William Blake and Buffalo Bill Cody, is physically evident in the weird monuments he scattered about his land. These include a secular tribute to explorer John C. Fremont in the form of a squat stone tower with a narrow window; the Browning Monument, a circular rook-like structure the poet raised to honor his friends; and the most bizarre — a stone pyramid that Miller erected in honor of the prophet Moses. The crumbling, ten-foot-tall pointed temple embodies the spiritual polyglot that Miller invoked in his poetry: Strangely wooing are yon worlds above us/Strangely beautiful is the Faith of Islam/Strangely sweet are the songs of Solomon/Strangely tender are the teachings of Jesus/Strangely cold is the sun and mountains/Strangely mellow is the moon on old ruins, goes a stanza in "Even So." Despite the forest it has become, Joaquin Miller Park is still urban. It's located entirely inside the city of Oakland. It's noisy, sometimes crowded, and littered with human artifacts, and much of the vegetation was seeded by human hands. Even so, visitors can still see a faded, mystical impression of what California once was, or what misfits like Miller imagined it to be: Here, cedars sweep the stream, wrote Miller about a California before its despoliation by civilization, and here/among the boulders moss'd and brown/that time and storms have toppled down/from towers undefiled by man/low cabins nestle as in fear. Twenty miles south of Miller's old home, in a similarly secluded fork of canyons branching into the East Bay Hills, was the hideaway of Agapius Honcherenko. Born in 1832 in Ukraine, Honcherenko helped wage a long and successful campaign against the tsar of Russia to end the institution of serfdom. A Russian Orthodox priest, Honcharenko wrote righteous tracts inciting serfs to rebel against their masters. For this, he was arrested and briefly imprisoned in a Constantinople dungeon. Freed eventually, Honcharenko was smuggled from Turkey to London, while the tsar's secret police and hired assassins — whom he called "Muscovite tyrants" — pursued him. He was shot, stabbed, beaten, and even drugged, but he survived to campaign against the Russian empire. He fled to New York City, and finally, in 1865, he escaped to the most unlikely fortress, a lonesome farm in the hills above Hayward. There, Honcharenko lived until 1916, all the time publishing a subversive newspaper that was smuggled into Russia and its territories. Garin Regional Park now surrounds Honcharenko's old "Ukraina" farmstead. The trails in Garin follow shaded creeks and arc up treeless sun-baked ridges, covered in sag brush and oats. Remnants of the old farm remain: gnarled fruit trees, rusted tractor parts. Cattle still graze private land nearby. Honcharenko's house was destroyed long ago, but you can hike to the gravesite where he and his wife Albina rest eternal. 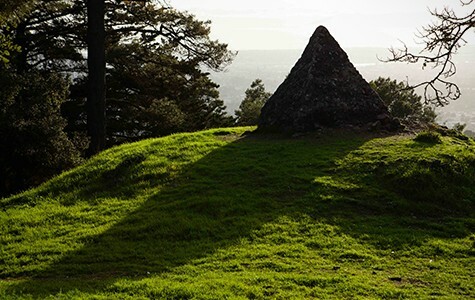 And if you journey far back into Garin park and climb down into a steep ravine cloaked in olive and bay, you can visit the most unusual formation of rocks that protrude from the mountainside. Here, in the shade and shadows, more than a century ago, Honcharenko led spiritual ceremonies in a sandstone grotto to sustain his battle against tyranny.